The other day, we shared our free Time Calculator that helps you discover just how much time you have to pursue new goals and achieve those things you've been putting off forever. Well, now that you know you DO have the time to work on the things that matter to you, let's get to working on getting to those goals. SPECIFIC – Your goal needs to be spelled out very precisely and you also need to have a reason WHY behind your goal…some benefit or emotional attachment that will keep you focused. For example, a goal might be to earn $12,500 per month and onboard 5 new quality clients monthly in the next 90 days. Using language that leaves no doubt as to what the goal is, why you want to achieve the goal, and how you will get there is very important. If you are not able to be detailed in your description of the goal, it will be hard to meet it. Take the time to do this part right. This is where journaling comes into play. It’s a report card and a method to measure what you want to accomplish and what you actually accomplished. And our 4X System Level-Up journal actually walks you through that and helps you achieve your goals 4 times faster. ACTIONABLE / ACHIEVABLE – There are different things that “A” can stand for, but it’s usually actionable or achievable. In order to achieve anything, you must take action. So, make your goal actionable, where you do something each day that will eventually result in an accomplished goal. Goals should also be achievable or you will quickly get frustrated. Be accurate about the time it takes to reach a goal, and what actions it takes to get there. Also, know who will be responsible for doing it. REALISTIC / RELEVANT – “R” can stand for realistic or relevant, and both are important. If you want your goal to succeed, it should most certainly be realistic or you will fail. If you’re currently making $500 a week and your goal is to increase that to $12,500 in 90 days, that’s not realistic. However, you may be able to increase it by $300. Once you achieve that goal and are earning $800 a week, you can set a new goal to increase your income by another $500 a week or something similar. Your goal should also be relevant to your life’s vision and match your values. There’s no point in making or achieving goals that have no relevance to your long-term life goals. You could instead use that time to reach goals that get you one step closer to actually reaching your life goals. So always ask yourself, if the goal is relevant to your life goals. TIME BOUND / TIMELY / TRACKABLE – Various authors refer to the “T” in the S.M.A.R.T. acronym as time-bound, timely or trackable. All of these t’s are important parts of the goal creating and setting process. If you don’t set a time limit and you can’t track what is happening, your goal will be hard to quantified or show as achieved. To help you and your audience work through and create S.M.A.R.T. 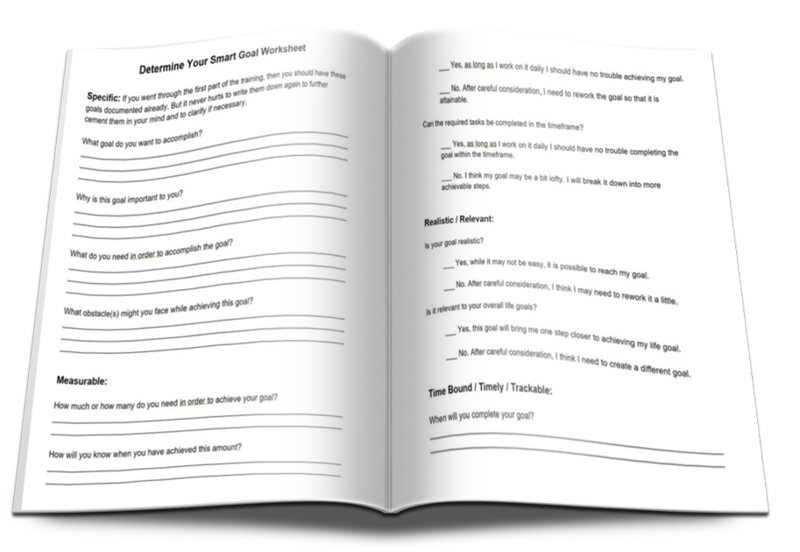 goals, download the quick guide and worksheet below. Of course, planning your goals is just the beginning to achieving them. From here, you'll need to implement your plans and come up with an approach that allows you to get their faster and stay motivated, which is what we do in the complete 4X System: Achieve Goals You Never Thought Possible 4X Faster training. You can use the worksheet for yourself or share it with your subscribers and customers. It comes with private label rights, which means you can brand it and distribute it. We've included instructions and a copy of this blog post, so you can easily share it with your audience too. This worksheet is one of the beginning steps to our 4X System: Achieve Goals You Never Thought Possible 4X Faster subject matter expert training, where we not only show you how to get more done in less time...but we also train you, so that you can teach the method to your own customers. We've created all the training and marketing materials for you. All you have to do is join us for a few training sessions, so you can be the subject matter expert and confidently deliver this high ticket training program to your students. To serve you best, would you answer these 3 quick questions about the program and we'll even give you a $​50 off coupon to thank you for your time? It’s a super easy way to get immersed in selling high-ticket training products…without having to do all the hard work. The survey will only take a moment and will allow us to create the best training program for you possible.